It's nice to have a can-do approach to driving. The Jeep Wrangler does its best to promote this mindset. Just think, if you want to head out with the top off, you can. If you want to open the vehicle up on your next visit to the beach, then you can because the doors are easily removed. The Wrangler gives you a number of options to personalize your next drive. 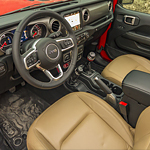 Before you leave Laurel Chrysler Dodge Jeep Ram, you can inquire about the many other ways that you can customize the 2018 Wrangler. It is made to be upgraded. This means that you can add performance parts such as lift kits, tires, improved engine components and even a new driveline. You're only limited by your imagination.